I’ve been on a cake-baking kick these past few days because I only recently bought my own copy of Rose Levy Beranbaum’s seminal work The Cake Bible. I tried a few recipes this weekend, but my favorite is this simple buttermilk cake. It’s not much to look at, but it has the softest, most gently sweet crumb. It’s delicious after dinner or to enjoy with friends and iced tea on a warm afternoon–nothing fancy, just a happy cake for a happy time. I’ll share the recipe below, but first please indulge me and take a look at that Bonne Maman jar just to the right of the cake. It’s filled with–get this–homemade creme fraiche. As the name suggests, creme fraiche is French, a product that only recently began appearing anywhere but the most upscale gourmet food stores here in the states. It’s thick like sour cream but less sour and, with a teaspoon of sugar, whips up into something thicker and far more luxurious than whipped cream. Of all dairy products, it alone has that certain je ne sais quoi. You can get it at Whole Foods or other stores, but I hit the dairy aisle this weekend and of course couldn’t remember why I was there, so I bought some yogurt and left. When I realized what was missing, I remembered once seeing a recipe for creme fraiche that, insanely enough, called for leaving a mixture of heavy cream and buttermilk out overnight to thicken at –wait for it–70 degrees or above. Eeew, I thought, but I mixed my dairy, covered the jar, jacked up the heat and in the morning, voila! I was afraid to taste it. My mom taught me to fear any and all dairy that isn’t straight from the fridge and it looked suspiciously like mayo, of which I am not a fan. But finally I did and it was the real deal. Really. I’m not saying you should run home and make it yourself, but I’m glad I did. Sorry for the bad image of the completed cake, but Lydia and I were having a little too much fun to remember the shot. And yes, the cake was actually made this past weekend. The summery-looking peaches are from Blum Ranch in Acton, CA which grows a variety that ripens later than most, from August through the end of October. These were the last of the bunch. Preheat the overn to 350 degrees. Butter a 9-inch round cake pan, line the bottom with parchment paper then butter again and flour. In a medium mixing bowl, whisk together the yolks, 1/4 of the buttermilk and the vanilla until just combined. In a large mixing bowl, use a handheld mixer to combine the dry ingredients. Add the butter and remaining buttermilk and mix on low speed until the dry ingredients are just moistened. Turn the speed to medium and beat for a minute and a half to develop the cake flour’s gluten which will give the cake its structure. Be sure to scrape down the sides of the bowl with a spatula. Continue mixing and add the egg mixture in three batches, mixing thoroughly after each addition. Pour the batter into the prepared pan and smooth the top of the cake with a spatula. Bake until lightly golden brown and a knife inserted into the middle of the cake comes out clean,about 30-40 minutes (mine took 35). Let cool on a rack for 10 minutes before inverting. Because this cake is so soft, make sure to gently invert again, so that the top of the cake is facing upward, which will keep the cake from splitting. Whip cream or creme fraiche with a teaspoon of sugar until fluffy. 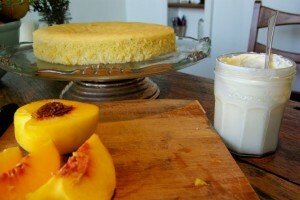 Smooth a generous amount of cream on top of the cooled cake and top with fresh fruit of choice. I arranged peach slices into a circular pattern, but this cake would be wonderful topped with summer berries as soon as they’re back in season.